Daily Illuminator: Your New Roommate Is Cthulhu! February 11, 2010: Your New Roommate Is Cthulhu! Peanut butter and chocolate. Laptops and wifi. Pencils and erasers. Some things simply go together -- like Cthulhu and roommates. Trust us, it makes sense, especially after you read SJ's Developer's Notes. Yes, Cthulhu cultists are on the shelf of your local game store, ready for moving into your apartment, eating your food, and keeping you awake with loud televisions. 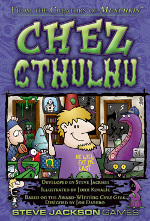 Chez Cthulhu is now available! Tonight, Randy will be gaming at Millennium Games and Hobbies in Rochester, NY from 6-10pm. For Randy's complete itinerary, check out our Where's Randy? page.